The opening hole at Fullerton has a dramatic downhill elevation change with a creek on the left and out-of-bounds to the right. The approach shot is uphill with a bunker on the left-hand side of the green. The tee shot is the most important shot on this hole, as there is only a narrow landing area with the creek on your left-hand side and out-of-bounds to the right. As golfers approach, 175 yards out, the fairway doglegs to the left. The small green is protected by a moderate uphill grade. A great risk/reward hole. Golfers who can carry the ball 250 yards can clear the creek, leaving less than 100 yards to the green. Shorter hitters who lay-up will be left with about 160 yards to an elevated green that is protected by two bunkers and a hazard long and right. The third hole is the number one handicap hole on the course. A reachable par 4 with two bunkers protecting the front of the green. The undulating green is one the largest on the course and slopes from back to front. The longest par 3 on the course with out-of-bounds on the right-hand side. The hole plays longer than the yardage, as it is against the prevailing wind. A bunker in front of the green adds to this hole’s difficulty. This par 3 is protected by a greenside bunker in front. The green is wide but narrow, adding challenge to your tee shot. This short par 3 is not too difficult. If you miss, miss to the right of the green as the left is protected by the creek. The green on this par 3 is large and slopes from back to front. The hole is protected by two greenside bunkers. From off the tee, the creek runs on the left-hand side. The last hole of the front nine has an uphill elevation change on your second shot, which can make club selection difficult. The back nine begins with a difficult tee shot off this par 4, as golfers need a 225-yard drive to carry a daunting ravine. Your second shot is to a small green protected by a bunker on the left and O.B. if you go long. This downhill par 3 is protected by two bunkers. Control is key here as a long tee shot brings the creek into play. A golfer who can play a right-to-left shot can score well on this dogleg left hole. The green is protected by an ash tree and bunker on the left and another bunker on the front right. This narrow, two-tiered green is this hole’s biggest protector. The tee shot has trees to negotiate on the left and the creek to the right. The longest par 4 on the course, which plays as a par 5 for women, has the creek to the right and out-of-bounds to the left. The second shot is uphill to a large green that slopes from back to front. This downhill par 3 has the entrance road to the right and a long, narrow green, which plays into the prevailing wind. Control and placement are key here. This hole is a dogleg right with an uphill approach shot. It requires an aggressive tee shot as the elevated green is hard to hold. The smart tee shot on Hole 17 is a lay-up, and woods are not to be used on this hole. The second shot should find the small green over a well-placed bunker. The par 3 finishing hole at Fullerton is protected by a bunker on the right-hand side. Golfers must hit over a ravine to a large and flat green. Fullerton Golf Course is located just north of Anaheim in Fullerton, California, only five minutes north of Disneyland. The course is set in a small valley and features dramatic dogleg fairways and constant elevation changes as it follows beautiful Brea Creek. Although Fullerton is a shorter golf course at 5,159 yards, it has many characteristics that make golf challenging for all levels of players. 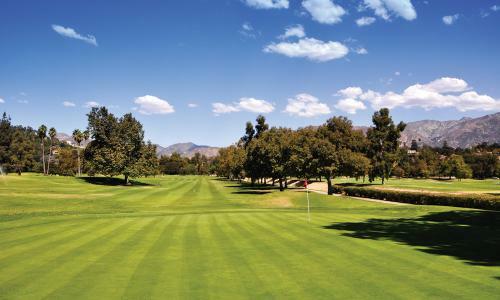 The first three holes are some of the most difficult in Orange County. Brea Creek comes into play on 12 different holes, often protecting the quick Poa annua and bent grass greens that define this enjoyable course. With narrow, immaculately-tended fairways and natural water hazards, good shots are highly rewarded but errant shots will find trouble. A full-size driving range and two practice greens are also available to warm up before teeing off. Challenging and immaculately tended 18-hole golf course. New irrigation system is greatly improving playing conditions. Very competitive prices for the Orange County golf market. Well-stocked Pro Shop with friendly and knowledgeable staff. Café offers breakfast and lunch, as well as a full bar. 25-station driving range with new mats and range balls, as well as two putting greens.